Joe Satriani's lawsuit against the band Coldplay, based on his claim that Chris Martin and co plagiarized his 2004 song If I Could Fly for their 2008 single Viva La Vida, has been dismissed from court. Satriani brought a lawsuit against Coldplay last December, alleging that the band copied "substantial original portions" of his composition for their Grammy-winning song, and sought a jury trial to award him monetary compensation. "I felt like a dagger went right through my heart. It hurt so much," Satriani told MusicRadar exclusively last year. "The second I heard it, I knew it was [my own] If I Could Fly. "Almost immediately, from the minute their song came out, my e-mail box flooded with people going, 'Have you heard this song by Coldplay? They ripped you off man.' I mean, I couldn't tell you how many e-mails I received." According to News.justia.com, the case was dismissed yesterday (14 September) in California Central District Court "upon stipulation," suggesting that an out-of-court settlement may have been reached. 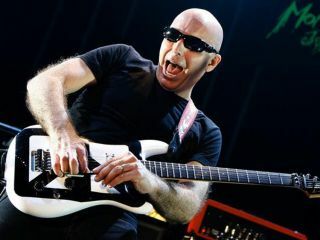 MusicRadar contacted Satriani's attorney, Howard E King, who said, "No comment. The case has been dismissed." Judge Dean Pregerson decreed that both the parties bear their own trial costs as the case was closed. In unrelated Joe Satriani news, the RIAA has just certified Chickenfoot's self-titled debut album as Gold, having shipped 500,000 copies.